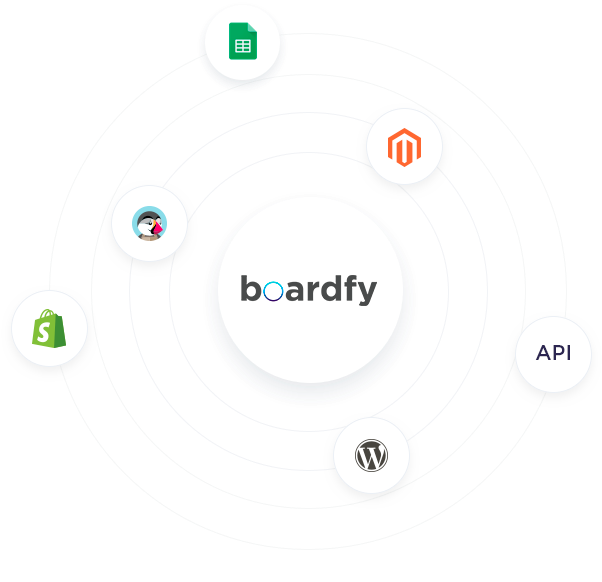 Synchronize your ecommerce and Boardfy in real time. We have developed plugins and tools that are very easy to install and that guarantee that a price change in your store or in our system is synchronized instantly in a bi-directional way. Shopify is the leading e-commerce platform in the US and the rest of the world, with more than 500,000 customers worldwide. Prestashop is the most popular ecommerce publishing system in Europe, with more than 250,000 online stores in 195 countries. And it’s free. Magento is one of the more robust and stable cms for ecommerce in the market. It is also known for being the most used one for large ecommerce projects. Woocommerce is the e-commerce plugin for WordPress. Completely flexible, it allows you to have a quick online sale system to install and it’s free. If you prefer to have control of price changes with your systems or ERPs and prefer to receive Boardfy information in real time, then we have a perfect API for you. If you have your own development or a cms that we do not have a plugin for yet, there is no problem. You can integrate your system with a csv or xml feed from Boardfy. We do not have an integration with your CMS? No problem. Write us and tell us what system does your e-commerce work with and our operations department along with the development department will study the possibility of putting it on Boardfy’s roadmap. If you do campaigns in Google Shopping, we have the best tool to optimize your advertising investment. Increase sales with the same budget, reduce the cost of acquisition and improve the conversion rate of your Adwords campaigns. Amazon is the leading online store worldwide. By becoming a marketplace, any company can become Seller and sell through Amazon in Europe, America and Asia. Ebay is the second largest marketplace in the world. Thanks to the ebay professional sellers program you can find customers in more than 25 countries. Walmart is a retail giant in the US and an online marketplace at the height of Amazon, which allows professionals to sell through its platform. Fnac se ha convertido en marketplace y está disponible en Francia, España y Portugal. A través de fnac puedes explorar nuevos mercados y nosotros te ayudamos a optimizarlos. Kuantokusta is the largest price comparison site in Portugal. If you do campaigns through this site, we help you optimize your investment in marketing. Promofarma is the main marketplace for pharmacy and parapharmacy products in Spain and Portugal. From Spain, Uvinum has become the Europe’s largest wine marketplace with more than 90,000 references. Of Japanese origin, Rakuten is a large marketplace with presence in the USA, Brazil, Japan, Taiwan, France and Germany. Do you sell through a marketplace that you do not see on the list? No problem. Write us and tell us what you would like to have integrated in Boardfy, it is likely to be next in the list in just a few weeks.